The PowerPoints you download are good for review. But most do not have a narration or captions. To see animations, you need PowerPoint 2002 (from Office XP) or PowerPoint 2003 (from Office 11) or download the Windows PowerPoint viewer (click here for viewer 1.86 Megs). The new Office for Mac may work, but I haven't tested it yet. To Download click with right mouse button and choose "Save Link Target as..." However, if you just click on the link and have PowerPoint on your computer, the presentation may start downloading in the background (no message) and it might take awhile before you see the PowerPoint presentation popup. SYLLABUS: If you just want to refer to the syllabus, click here. You can download the syllabus handout for printing. It is in PowerPoint format. Click here (1.4 Megs). If you want to download the syllabus presentation shown in class, click here. (11 Megs). The videos used in the presentation are not included. They would take up too much space. THREE BARRIERS TO LEARNING: This is the presentation given the second day of class. It is about the Three Barriers to Learning. Also, the videos used in the presentation are not here because of their size. 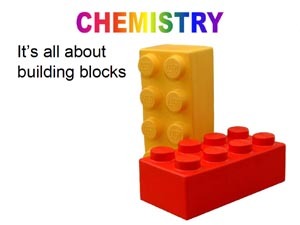 IT'S ALL ABOUT BUILDING BLOCKS: Chemistry is made simpler when you realize it is all about building blocks. You can download PowerPoint shown in class, but you will get more explanation going through the six online tutorials listed below.. EARLY USES OF CHEMISTRY: This presentation was used to explain why chemistry became a subject. 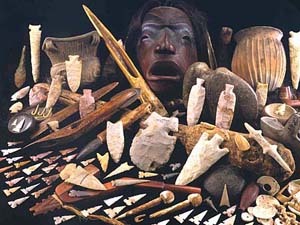 It's based on our need to survive. Below is a link to the PowerPoint used, but you will get the written narration if you go to the tutorials for this subject following the links below. This PowerPoint is a tutorial on how to name non-metal binary compounds. For example, carbon dioxide is a non-metal binary compound. Carbon and oxygen are non-metals. This one is shown in class but is good for self learning. To download click here (1.8 Megs). This PowerPoint explains what "ions" are plus helps in understanding the charges that atoms have. This knowledge is useful in naming ionic compounds. Download (629 K). This PowerPoint gives details on naming ionic compounds. Ionic compounds made from two elements (binary compounds) and those that use polyatomic ions are covered. Download (915 K). This PowerPoint gives details on naming acids based on their salt name. This covers both binary acids (e.g., HCl, HBr) and ternary acids (e.g. HNO3, H2SO4, etc.) Download (216 K). Humans have always fought against chaos. The development of the Periodic table tracks the efforts to understand and organize the chaos. 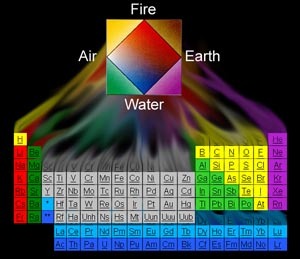 The table of elements started with just one element (water), then four elements, up to the present table that has well over a 100 elements. The Periodic Table of the Elements lists the elements, but were they always here? If not, where were they created? This journey starts with the elements beneath our feet and travels to distant galaxies. But it ends 15 billion years early at a point where you can easily touch. This PowerPoint gives the main topics that are covered on the first test. The questions will be similar but not the same. This PowerPoint first points out the complexity of the English measurement system, which is why the metric system was invented. How metrics was invented is covered plus how it simplifies all of our measurements. Download (6.3 Megs). A gram of water requires one calorie of energy to raise one degree. Other materials have their own specific amount of heat to be raised one degree. This property is called Specific Heat. This presentation also covers how this knowledge is useful. These five pages are the study guide for the test. They are in PowerPoint format but designed to be printed. Download (435k). 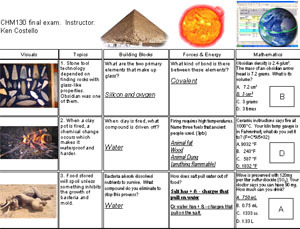 If you don't have PowerPoint, you can view this Web page that has the study guide pages as images (about 1 meg). 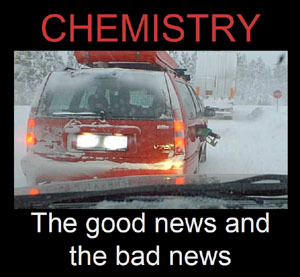 This short presentation presents the good news about chemistry, which is atoms combine in simple ratios and most chemical reactions involve a small number (small count) of elements and compounds. However, the bad news is that they are two small to count and it takes so many of them to be of use. This PowerPoint clears up some myths about water. It also teaches about the different ways of expressing concentration such as weight to weight percent, weight to volume percent, parts per million, and molarity. A few molarity problems are covered. Size is 3,861 kilobytes (3.8 Megs). Click to download. IDEAL GAS LAW: This presentation covers the history of gases and how they were put to work. It also covers how the PV=nRT formula came about. P=pressure, V=volume, n=moles, R=conversion constant, T=temperature. 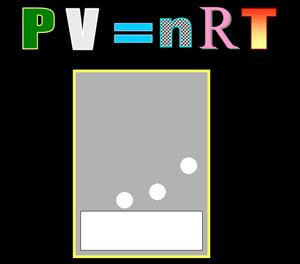 Counting molecules of gases is impossible, but they can be counted using the PV=nRT formula.